Yes, it's Jackie here again today. Today I am focusing on Kreaxions punch #310. I used the star template and the punch with insert A to create the doily on the bottom. I used the Circle cutter, then used Stencil A and the punch without any insert to create the doily on the upper right. The circle on the upper left is the negative from that doily. I used the punch with insert C to create the corners on the patterned paper. I used MME papers, the fiber is unknown, the chipboard is from the dollar store and so are the buttons. A lovely little Thank You card. Hello everyone! Happy Mother's Day!!!! Boy are you in for some awesome treats with these reveals today! The Design Team members have worked hard this month to bring you a variety of projects using the Just Imagine/Kreaxions products! Our theme was Mother's Day, Girl, Friends and Women. First up is Bev who created a mini album of McKee Botanical Gardens with Florida neighbor. She used Kreaxions Punch #916 and Kreaxions Circle Cutter. .. on the 3 pages added... (not every page) Theme mother's day.. so here is Katie with the kids at Gardens..will give it to her when we go back to Florida in the fall. Next up is Joan's Baby Bump Page. How ADORABLE! She used Kreaxions Punch #309 with B template, Kreaxions Positioning Parts 8CM (small) and the Kreaxions Circle Cutter. Next is Charity's beautiful Mother's Day Card. I love the big blue doily! She used the Kreaxions Circle Cutter, the Kreaxions Star Template, and Kreaxions Punch #910. Next up is another beautiful Mother's Day card from Erin who used Kreaxions Punch #905 with C insert for a border. It's so bright and cheery! Karen did a layout of Friends on National Scrapbooking Day. She used Kreaxions Punch #920 with Template A on the Kreaxions Star Template. She made the corners using Kreaxions Punch #920 with Template C.
Here's a better look at Kreaxions Star Template using Kreaxions Punch #920 with Template A and the corners done using Template C.
Changing the subject a bit is a sympathy card from Ginni. She used Kreaxions Punch #304 for the top and bottom borders. We can all use a nice sympathy card now and then and this one fits the flowery theme of spring and Mother's Day. And last but not least is a FABULOUS watering can full of flowers from Jackie! What an ADORABLE project!!! Jackie used papers from K & Company and Kreaxions Punch #301 with no insert to create the bottom border and then she used the negative for the top border. This would make a lovely gift for any mother on your list. We hope these projects inspire you to make your own creations using the most fabulous Kreaxions products listed here! Happy Punching! Hi, Jackie here with you today sharing a gorgeous card. Hello, Jackie here with you today. To create this beautiful layout I used a mix of papers, Imaginsce, My Mind's Eye and Echo Park. I used Kreaxion's Punch #301 with C insert for the corners and Punch # 310 without an insert for the borders. The flowers are Recollection and the ribbon is from Celebrate It. I used my Cricut to cut the title and the Kreaxion's Circle cutter to cut the circle . I made these cute little milk carton houses to use as treat boxes for a co-worker. I used my Cricut and the Sweet Tooth Boxes cartridge for the milk carton houses. I made the decorative edges on the roof of the houses and the border on the holder by using the Kreaxions punches #301 and 916. Hi everyone Monica here and good morning on this beautiful November day. I made this card and I used Kreaxion 301 punch to make the border piece along the side, but I always used to make a half rosette (you can call it that) for the decorative piece by the flower. This was colored with a blend of Copics and Spectrums the red on her jacket is all Spectrum Noir pens - I have heard they came out with a new line so I have to check those out too! This month we are celebrating family... and we have lots of great pages to share with you. Sweet Family page is by Ginni. I used Kreaxions Punch #916 and the Kreaxions Star Template to create this page about my grandmother, my aunt and my parents. The border was created with no template, then I used all the cutaways from the star template as well. All the papers used on this page were 6x6! Lisa used the circle cutter & Punch #301 with no insert for border. Joan shared this page called Happy. She punched the border strip with the Kreaxions 4 in 1 punch #304. I used the Circle Cutter to cut 1 1/2" circles to make the scalloped edge. Bev used the Kreaxions circle cutter for the large circle then punched with Kreaxions Punch #310 and then recut yet another circle to create a punched a border ring rather than a full circle. Wendi shared this thanksful 4 my family page. Wendi used Kreaxions Punch #905 for her banners.. what a great touch. Charity shared the Fab 4 page of family. Charity used the circle cutter and Punch #905 with insert A on the round photo mat. For the banner she used #604, #611, #902, #905, and #915. She also used a sketch by Bev Code for inspiration. Karen shared this engagement page. She used Kreaxions Punch #917. On the corner she punched and then used the negative piece too. Karen used the punched out hearts only on the scallop border. Monica shared this fab page of family. Monica used the Kreaxions circle cutter to make the great orange looking flowers and also Kreaxions Punch # 309 on the border strip. LeeAnne shared the great we are family page. LeeAnne used the Kreaxions Punch #310 with Insert A to punch the border in all four corners of the kraft card stock background and also used the same punch (Kreaxions Punch #310) with Insert B to punch all four corners of the polka dot paper background. All the circles on the layout were cut with the fabulous Kreaxions Circle Cutter. The Kreaxions DT had a great time creating and sharing family pages to show just a few ways to use Kreaxions products. Be sure to visit often to see what else we have to share with you... thanks for stopping by today. I used the Kreaxions 4 in 1 Punch # 301 with no insert for my border. 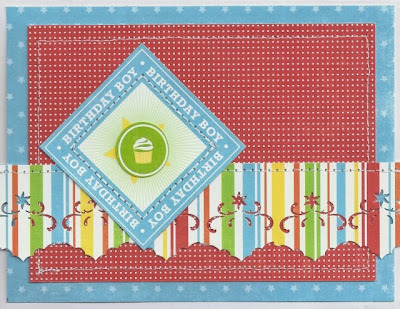 Love how it pops against that red patterned paper!